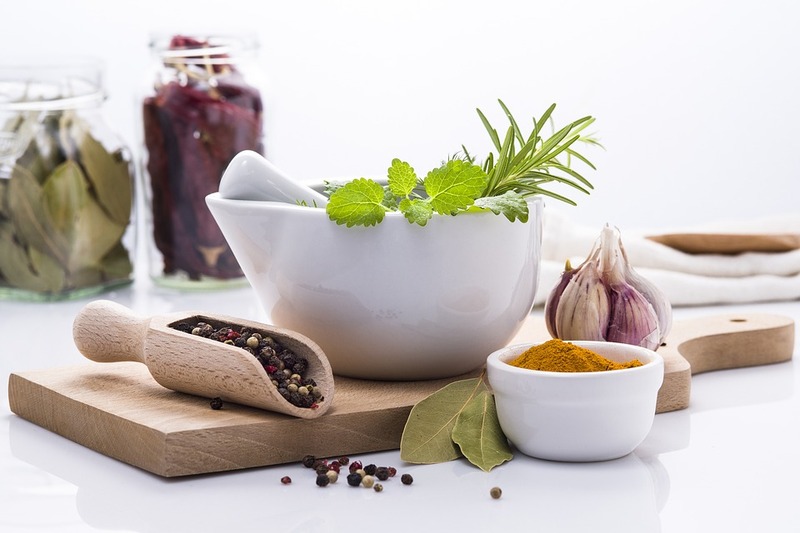 As our cooking knowledge and skill grow, we will be experimenting more with herbs and spices. Guess where this leads us to? Kitchen drawer or cabinet full of bottles and packets of herbs, spices and seasoning blends. There are chances that some of these will be on the kitchen counter too. No one wants a messy counter. Nor a cluttered drawer or cabinet. The best cooking moments should NOT be spent searching through your cabinets. 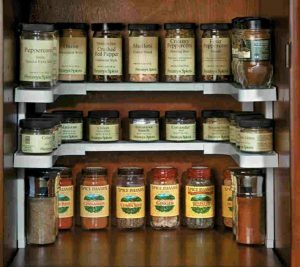 Therefore, an organized corner with a functional spice rack organizer will help. Read on and check out the Best Spice Rack Organizer 2019 I have collated for you. Before looking into the products, find out what are the benefits of using a spice rack and things to consider when buying one. Obviously, it is to keep cabinets, drawers or kitchen counter organized. Pleasing to the eye. Find and grab what you need quickly. Wouldn’t want to burn your garlic while searching for the spices, do you? Well, it happened to me – searching for the chilli flakes, burnt garlic. Customize spice arrangement to your needs. Herbs and spices that are commonly used can be arranged on a rack nearer to the cooking counter. While those less common can be organized in the cabinet. Or arranging all in one rack but those needed more often in the front row. All to your preference. Maximize the space you have got. Herbs and spices neatly arranged in a 3-tier rack hooked onto the wall will give you all the counter space. A decorative piece on your kitchen counter. While some spice racks are meant to be placed into the cabinets, others are in fact eye-catching to be displayed on the counter. Location and space. Decide where you want to place the rack – in the cabinet, drawer or kitchen counter. Measure the space availability and compare with the product specification as I am sure you do not want to go through the hassle of returning it. Adjustability. Some spice racks are adjustable and it will help to maximize your space availability. Capacity. How many herb and spice bottles do you have? Are you planning to display them all or only those that you use regularly? You may consider buying 2 units that accommodate a different number of bottles. One in the cabinet and another on the countertop. Assembly. Some racks need to be assembled and special tools might be required. Also, consider if you are able to do it yourself as some mounting methods can be cumbersome. Jars inclusive. Check the jar sizes. Some may not fit the whole jar of store-bought spices. You may end up throwing away the extras or having more bottles cluttered in your cabinets. Spices inclusive. Herbs and spices included may not be the ones you use. Additionally, they are not necessarily the freshest. The price range for a spice rack organizer typically varies from $10 – $50. However, some pretty units that doubled as decorative pieces may cost more than $50, even $100 and more. So, let’s get started with the products list – sorted into 4 price range. The rack comes in two separate units. This allows you to adjust the heights between them according to your need. You may even creatively install them in zig-zag position. The strength of the mesh can be better. The bottom may be uneven and some may droop at the centre. This will cause your spice bottles to slide to the centre. However, if the shelf is fully filled, it will deter the bottles from sitting on a slant. This is a simple spice rack but serves its purpose for less than $15. You get to decide where and how to position it. Also, check out the Paper Towel Holder. A matching design that goes beautifully together with this Single Tier Mesh Spice Rack. Amazon Rating: 4.5 out of 5 stars; 1,113 customer reviews. 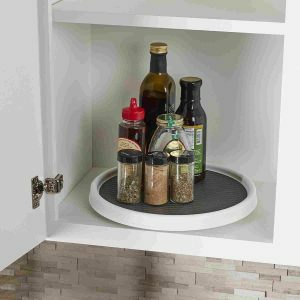 The lazy Susan glides easily to find the spice you need. No more shifting bottles and jars in front to get the ones you need behind. The 3/8” rim prevents items from falling off as you turn the turntable. This 2-Tier turntable can only be used as a single unit. It cannot be used separately because only one tier has the rotating base. You have the option to buy a Single Tier Lazy Susan Turntable. This is a functional unit that needs NO mounting. Having your spices and seasoning blends arranged neatly onto this turntable is definitely a better scene of your kitchen counter, should you decide to put it there. Else, it is also good to put it in your cabinet. Amazon Rating: 4.8 out of 5 stars; 1,080 customer reviews. Soft foam keeps bottles securely in place. This prevents the bottles from moving when you open or close the drawer. Bottles can be placed with labels facing up so that you can quickly find and get your needed spice easily. No installation or permanent mounting required. Therefore, you need not worry about damaging your cabinets should the installation goes the wrong way. The liner can be easily removed for cleaning. Whatever size drawer you are working with, the liners can be trimmed to fit. Everyday scissors will easily cut through the foam liner to the exact size of your designated spice drawer. If you do not have many spice bottles, you may end up losing space. However, consider filling up the empty spot with canned or jar food. Knives too. 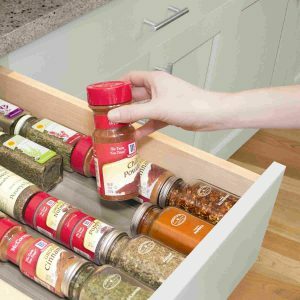 This YouCopia SpiceLiner Spice Rack Drawer Organizer is an easy, affordable storage solution that allows you to build a customized spice drawer. Amazon Rating: 4.7 out of 5 stars; 1,336 customer reviews. Spice bottles can be arranged neatly on the step shelf in the cabinet. The elevated steps allow you to easily see all your spices. A deep cabinet has an advantage. You may arrange one unit behind another. Elevate the back unit using a wooden box or similar and you will have 6 steps of neatly arranged herb and spice bottles. Not meant for small cabinets (low in height). If you have larger/higher spice bottles, they do not fit on the top shelf. And, having these arranged on the front row will block what is behind. It defeats the purpose of having this expandable cabinet spice rack. However, if there is some extra space, the higher bottles can be arranged as is by the side with the smaller ones on the shelf. While this is good for organizing herbs and spices in your cabinet, it is also suitable for the countertop. No more scattered bottles, jars and miscellaneous. Neat and tidy it is. Amazon Rating: 4.5 stars; 64 customer reviews. Ease of cleaning. The rack is easily taken out from the cabinet for cleaning since it is not mounted or glued on. Ease of viewing. It can be difficult to see all the way into the deep corner. Having the spices bottles raised in the end corner, you will be able to see them easily. Difficult to read the label of bottles in the middle or upper row. Each level is 1.5” higher thus you may not be able to see those in the second and third row. If you have various sizes of spice bottles, try arranging the smaller one in front and taller ones at the back. This will increase visibility. Easily maximize the corner space with this 3-tier corner organizer and you need not worry about mounting or assembling the unit. Serves its purpose well. You may now effortlessly find your tidily arranged spices at the corner. Amazon Rating: 4.8 out of 5 stars; 2,029 customer reviews. Besides the kitchen area, this multi-purpose organizer is also suitable to be mounted on the inner pantry door. You may consider mounting 2 or 3 units on the door to organize miscellaneous items too, together with your herbs and spices. It helps greatly to declutter your pantry. Can be better if it is deeper. The depth of the basket can only hold spice bottles in one row. If you have smaller bottles and wanted to maximize it, you will have to stagger the position. The strength of the mesh can be better. The bottom may droop at the centre if the bottles are too heavy. You could arrange the bigger/heavier bottles on the side while the smaller ones in the middle. Your choice as to where this rack is mounted. Together with the Single Tier Mesh Spice Rack and Paper Towel Holder, they surely make a perfect scene on top of their functionality. Feature pour and shake design. 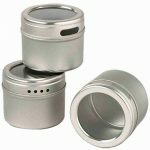 These magnetic spice tin can be attached to refrigerator doors, grills or to any flat metal surface. This is the best option to organize your herbs and spices where space is limited, freeing up your cabinets, drawers or countertop. 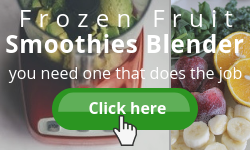 With the pour and shake design, you will have the option to use either depending on what you are using – seeds or powdered spice. The see-through lid enables you to easily identify the herbs and spices. Furthermore, the label that comes with these spice tins is transparent PVC material with large black fonts for easy reading. Some of the lids may be too tight, thus difficult to turn. You may have to spend some time to find the best match among the 12 tins. After some time using these spice tins, you will notice that it becomes a bit difficult to turn the lid, closing or selecting the pour or shake option. This may be caused by the tiny bits of herbs or spices that got stuck between the rim and lid. While filling up the tins with your herbs and spices, try not to fill them too full to the rim. Also, give the tin a couple of gentle knocks after each use so that the bits and pieces drop down to the tin. By far, these handy storage jars with magnetic backing is the best option where limited space is concerned. You can make full use of the side of the refrigerator. If the refrigerator is a bit far from the cooking counter, you can install a Stainless Wall Plate Base nearby to use as the base. Displayed on your countertop, it doesn’t take up much space. Yet able to hold 18 types of herbs and spices. The sturdy rack allows you to get the spices in and out with ease while knowing that the others won’t rattle or fall out of place. The holes in each lid are a bit tiny. Spices in powder form get through but those in seeds form or herbs like basil or thyme don’t. You will have to take the lid off to pour content into your palm or use a measuring spoon. The bottles don’t hold much. Filling up the bottles and keeping the extras in the cabinet might be a deterrent for some people. But then, this is a beautiful and compact piece to be displayed on your counter with easy access. Considering the sturdy material of the rack and inclusive of the spice bottles, this is a good buy. More so, if you want a pretty piece on your kitchen counter that gives the practicality you desire. Quick access. 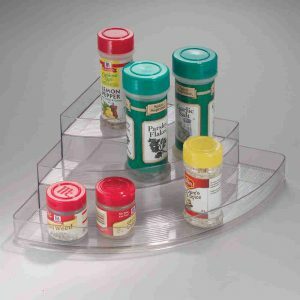 All your spice and seasoning bottles are within reach using this revolving spice rack organizer. You don’t have to dig through your drawers or cabinets to find the “one”. Great space saver. The compact and portable design of this rack sits on the counter without taking too much space. Additionally, beautify your kitchen too. Ease of use. You can easily open the top to pour out or shake the content. Reduce continuous refills. The capacity of the jar matches the standard retail pack. Thus, you only need to fill them up once with no extras to be kept separately. After some time using, some of the lids have difficulty to turn. So, dispensing will not be possible without removing the entire lid. This is caused by the herbs or spices being stuck in the lid components when you are shaking the ingredients out. With this issue in mind, you may want to give the lids a clean wipe with towel paper every now and then. Also, give the spice jar a couple of gentle knocks after every use so that the herbs and spices will drop down instead of being stuck in the lid. Additionally, do not fill the jar too full to the rim. This is a sleek and functional spice rack organizer for your kitchen counter that leaves you with more space to work on and easily grab your much-needed spices. The drawers pull out and lower to display spices at eye-level. You can easily find and reach your spices without any hassle of digging into your cabinet. This compact unit saves valuable cabinet space. All your spice and seasoning bottles can be arranged neatly in this spice rack organizer, leaving more space for other items. Made of plastic, it is a bit flimsy. But once you have arranged the spice bottles into the organizer, it becomes sturdier. Glass spice bottles may put too much weight on this plastic organizer. Having a mixture of spices in plastic and glass bottles will solve this problem. Balance is the key. 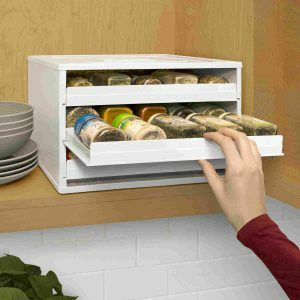 Neatly placed in the cabinet with the herbs and spices in it, this organizer is a great space saver with ease of accessibility. The width can be adjusted to maximize the space in your cabinet. The heights are adjustable as well. This product comes with different leg heights. So, you can choose which set to use according to the height of your cabinet. Stack one on top of another or placed side by side. Depending on the height and width of your cabinet, you have the option to stack them up or placed side by side. This helps to maximize your cabinet space. No mounting and glueing needed. No worries about damaging your cabinets if things go wrong. Expanded too wide, the middle of the rack is not sturdy enough to hold a certain weight, especially bigger glass spice bottles. Try to arrange those on the side while the smaller and lighter ones go to the middle. No tools are needed to set this up but it can be complicated as there are too many small parts to figure out which goes where. Made worse because no manual is included in the package. Well, there is one thing called “YouTube”. There is quite a number of “how to” videos to guide you through the assembly. Make it fun, do it with your family. At one glance, you will be able to see all your herbs, spices and seasoning blends. With the flexibility to adjust the width of the rack to fit into the cabinet, it helps to maximize the space. In addition, extremely easy to take your needed spice. No digging through or shifting the bottles. Provide instant access. It rotates 360°, allowing you to have easy access to your spices without digging or sifting through your cabinets or drawers. Just turn the carousel. A great space saver. Mount the unit under the cabinet or shelf, the countertop is all yours. If displayed on the countertop, you will still be able to save some space. Buy 2 and stack them. Now, you have 24 herbs and spices stacked neatly. Dispense with ease. The 3 ways of dispensing method make it so convenient to use. With a twist of the dial, you are able to dispense ¼ teaspoon of spice. Options to shake or pour your spices out. Additionally, the opening is big enough to accommodate measuring spoons. A bit cumbersome to fill the compartments with spices because the top lid doesn’t flip all the way back. You can use parchment paper as a funnel when filling them. May have to adjust the position to work at an angle. Certain spices will cake easily. The compartments are not air-tight thus you need to ensure the lids are covered properly. The Select-A-Spice Auto-Measure Carousel provides a unique way to store and sort your cooking spices. Also, it can be a distinctive decorative piece. Spice rack organizers can help make your cooking a smoother process. You need not waste time looking for your onion powder when you need it. Bottles or jars of herbs and spices are neatly arranged where you want them to be. No more messy and cluttered counter, drawer or cabinet. Some of us, who prefer a clean kitchen counter will want the rack inside the cabinet or mounted on the wall. 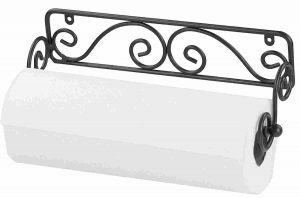 If we have enough space on the counter, I am sure we would want to use a countertop organizer doubled as a decorative piece. Plan where you want your spices to be and choose your preferred organizer from the list of BEST Spice Rack Organizer 2018. With a price range from less than $15 – $50, there should be one to fit your budget. No matter which you choose, you will never need to dig through your entire cabinet or drawer to find the one. Enjoyable cooking experience is what you will gain. 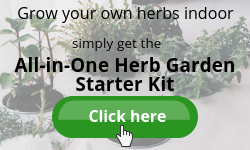 I hope this review has given you useful information in getting your herbs and spices organized and where you can purchase them. How do you organize your herbs and spices? 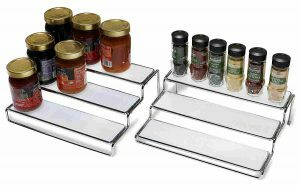 Does a spice rack organizer help? Share with us your experience in the comments section below. Since you will be having a spice rack organizer to neatly store the bottles, you can now have more variety of spices and blends. Let’s bring out the creativity in you – make your own spice rub! 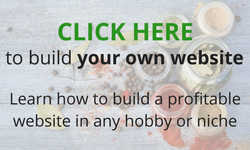 Click here, to find out how. If you find this product review helpful, please share it with anyone that you think might find it useful. Thank you and have a good day! Hi Sharon and thanks for showing me the many options available. I’ve just recently moved into a new home and I wasn’t sure what I wanted to do with all my spices. I have many!! Right now they are just on a shelf in my pantry which causes quite a mess. Half the time I can’t find what I’m looking for. I really like the magnetic tins. Do you know if they come with a magnetic strip to stick to any surface? You’ve given me some great ideas here. Congratulations on your new home! I understand how messy it can be having just relocated Am sure things will be better pretty soon. Unfortunately, the magnetic tins set does not come with a magnetic strip. However, you may purchase a Stainless Wall Plate Base separately on Amazon. You may mount the plate on the wall near the stove or side of the cupboard. Hope this helps. I’m just in the process of looking for a really good spice rack organizer and your suggestions on what I should be considering is very helpful. I hadn’t thought about the adjustability and it will definitely give me the right amount of space so there is no waste. The one I really like is the Decobros 3 Tier Wall Mounted Spice Rack… I can see exactly what the spices are. Thanks, I’ll check this out in Amazon as suggested. I am glad you found this helpful. With an organized herbs and spices corner, waste no time in searching. Spice up your kitchen and cook up a delectable meal in a jiffy. I’ve been checking out different ways to organize them, but this is by far the nicest one I’ve run into. Do you recommend having them inside a cabinet or outside? Does that affect the quality of the spices? As long as you store your herbs and spices at a cool place away from heat and sunlight, they are good. Looks like this is the best time for you to organize them. Now, get yourself a spice rack organizer! Inside the cabinet or outside? This depends on individual. For myself, I have them inside e cabinet because of the limited counter space. Moreover, I like a clean look. Go on. Choose one that suits your needs. I think I’ve reached the point in my life where I need to buy a spice rack and this website clearly details the different styles and price ranges. I think I even found the one I want. The spicy chef seems like a perfect in cabinet spice rack that actually conservesmore space then it takes up. 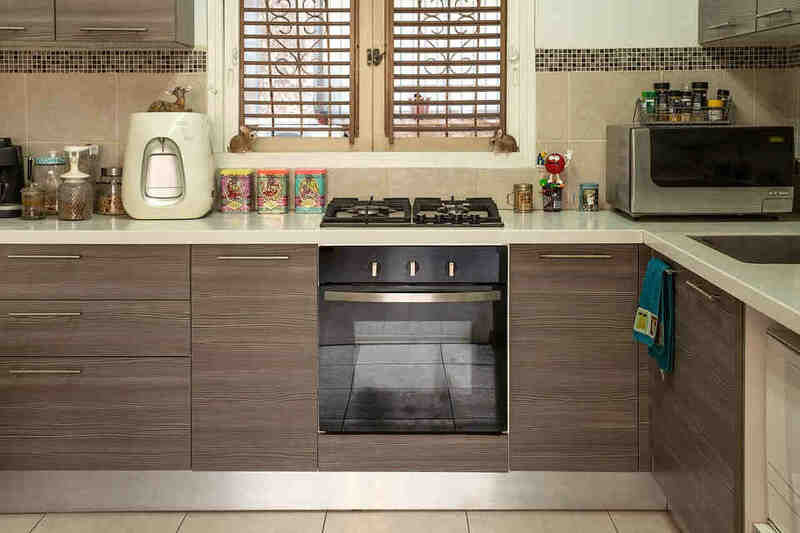 Do you know if the spicy chef comes in different sizes for large and small widthed cabinets? Does it come in different sizes? And lastly, can they be stacked on top of each other for extra vertical spice space? The width of the spicy shelf spice rack is adjustable. Therefore, you can maximize it accordingly. They can be stacked. So, you will get 3 levels of shelf if you include the bottom as one. Hope this helps you to decide. Let me know should you have further queries. I have tried many spice racks out over the years moving from place to place. My favorites so far have been the lazy susan and the three tier shelf rack. Never heard of the kitchen art automatic measuring spice carousel. That is a pretty awesome gadget for the price. I will have to look into that. Thanks for sharing your experience with spice racks here, Tony. Do check out the KitchenArt Select-A-Spice Auto-Measure Spice Organizer. Mount it under the cabinet or shelf will save much space needed. Else, it is a nice unit displayed on the counter. I was just in the kitchen trying to organize spice jars an hour ago! I always wish I had a better way to do this so your post here is very timely for me. I like the look of the Decobros single and 3 Tier racks and matching paper towel holder. I wonder if the paper towel holder has a stopped or is just free rolling? When they are free rolling it can be hard not to get extra paper towels rolling out when you only want one. It looks really nice though! Since we moved our roll of paper towels is just sitting on the counter. I really like the wrought iron look of the spice rakes from Decobros. The Blumwares Rotating rack looks nice too. The problem for me is that some spices we go through way faster than others. Cloves or something may be used so slowly that a tiny bottle would last for years. Salt and pepper may be used much faster. I don’t need that large size for many spices but it would be handy for others. This is such a fun topic! I love herbs and spices and love the look of them in the kitchen. Thanks for this useful post and site! I am glad you like the post and found it useful. The paper towel holder does not have a stop mechanism, unfortunately. But then, having the whole set of 3 really looks beautiful in our kitchen area. I hope you are able to find one that suits your needs within this post. For the love of herbs and spices, do visit periodically for more updates. There are many great ways to use common cooking herbs and spices which I love to explore and share. Wow, what a selection of spice racks! I kept think I liked one as my favorite and then there was another and another. So many to choose from! 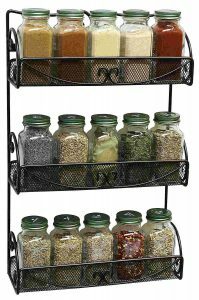 I think I like the DecoBros 3 Tier Wall Mounted Spice Rack the best. I like that I can mount it on the wall inside the pantry. Making it kind of hidden, yet easy to get to. Great ideas! Nice to see you here again, Matt’s Mom. Personally, I prefer to keep all my herbs and spices in the cabinet. Just like you said, hidden. DecoBros 3 Tier Wall Mounted Spice Rack is a good choice, either mount at the back of the pantry door or should you change your decision to mount it nearer to your cooking area. Hope you get your best spice rack organizer soon! 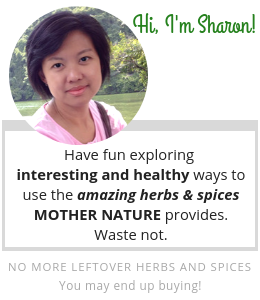 Drop by again for more articles on herbs and spices. My sister’s birthday is coming soon, and I was thinking of offering her a spice organizer. She has one, but it is a bit outdated now, and I think it’s time for her to replace it with a new one. I really like the single tier mesh spice rack. I just would like to know. Of what material is the spice rack? Some material tends to rust after a while. This is a sturdy steel-wire construction spice rack. Since it is not stainless steel, it may rust but the fine bronze finishing gives it a layer of protection. Moreover, using this rack in a dry area storing herbs and spices should not has a problem with rust. Let me know if I can be of help in choosing the best spice rack for you, for your sister. But this is so helpful for me . Don’t know which I would choose. You are absolutely right, Ariel. From garden to pot is the BEST! The aroma and taste of the basil from my backyard garden I used to cook Basil Chicken were delectable. I have always found my spice cupboard to be the least organized space in my house. I always try to prepare in advance when cooking. It almost never works out though. You always need that one thing you forgot, or it is missing a flavor. I have been looking for an option to get more organized. You have a lot of really great ideas here. I really like the small metal tins with the magnets. Do you know if they have a wall mount or door mount for them? I think those would look great right near the stove too. Since I process a lot of my own herbs and spices may also be the best choice. The magnetic metal tins looked neat, don’t they? Unfortunately, this set does not come with a wall mount. You will have to buy a stainless wall plate base separately, available on Amazon. I really like all of the products that you have in your article! I didn’t realize there were so many amazing options to choose from! There were quite a few that stood out to me like the, SPICY SHELF SPICE RACK AND STACKABLE ORGANIZER, the YOUCOPIA SPICELINER SPICE RACK DRAWER ORGANIZER, and the DECOBROS 2 PACK WALL MOUNT SINGLE TIER MESH SPICE RACK! These would be great gifts, not just for myself, but for my friends and family, as well, since we all can appreciate products that make our kitchen more organized, so we can maximize our space!! Hello Janis.I am glad you liked it. 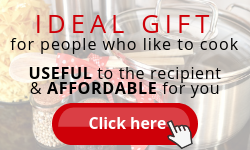 Since Christmas is round the corner, this is definitely a suitable gift for someone who loves to cook. Get one for yourself and another for your family member of friend. What great options you’ve presented here Sharon. I definitely must get my spices organized better, because there are those that get pushed to the back of the cupboard and I even forget about them. I am keeping this page open so I can take some measurements when I get home today. I need to get a better system put in before the holiday cooking! Hello Dianne. You are not alone in this matter. Recently, I found a bottle of red pepper flakes at the far end. Sadly, it has lost its spiciness. Eager to know which one you are going to choose. I use a lot of spices to marinades and also make my own curry pastes. A messy cupboard and disorganised contents. A spice rack would easily help this problem. The DECOBROS 3 TIER WALL MOUNTED SPICE RACK is the one I would go for to create extra room in the cupboards and also because I prefer a more traditional rack like this one. Isn’t it lovely, Darren? Glad you like it. I’ve really enjoyed reading this article as you’ve provided us with tonnes of valuable information on “Spice Rack Organizer”. I currently own the Decobros 2 and my life has been easy when I purchased it a couple of days back on Amazon. It’s flexible and very easy to reach out for spices without having to face any issues. The reason why I bought it is mainly because of the reviews of the product. Thanks a lot for taking your precious time in writing this post. Well Done Sharon! Looks like both of us have the same liking. Thanks for taking the time to read my review and comment. This article of yours is very useful. You shared proper information with regards to this topic. It is important to keep your kitchen counters clean and organized. I might as well buy a spice rack for my mom: “SPICY SHELF SPICE RACK AND STACKABLE ORGANIZER”. Anyway, keep on dropping that good content. Thank you, Jean. I am sure your mom will love it. Hey Sharon! This is awesome! Spices are so much fun to cook with. When it comes to organizing my cabinets, I absolutely love organizing things and i actually have been trying to find a better rack. I’m not loving mine right now. The boxed one looks cool. Thank you for that! 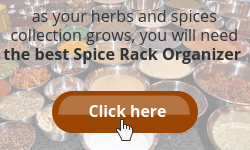 Great review with lot’s of information and available option about best spice rack organizer. I have used many spice racks out for many years while moving from one place to another place. So I like YouCopia SpiceLiner Spice Rack Drawer Organizer as my favorite one. However I am interested on the kitchen art automatic measuring spice carousel. This is new and awesome product I found with affordable price. I am going to check more information on that. Thanks for sharing. The spice carousel is something different and I believe it will be eye-catching on the kitchen counter. Go on, check it out and let me know which one you ended up with. I have enjoyed going through all these options you present here. But the one that has really clicked with me is the KitchenArt 25000 Select-A-Spice Auto-Measure Carousel Professional Series. It seems to save so much space. It makes our kitchen look organized. And it makes dispensing cool! Hi Henry. I believe you made the right choice. The spice carousel looked modern and professional. It will definitely look great in your kitchen. Oh, well organized too, of course. Spot on with the accumulation of spices, herbs and more! Very thorough article, with many options. I enjoyed looking at this article because I could scroll through and look at the different products and quickly see the pros and cons and the pictures are great! I still struggle with spice organization but that’s more of a personal weakness with my own organization. I tend to lean more toward the cabinet organizers since I don’t like the counters to be covered. I have tried the magnetic tins but find I don’t like that I can’t see the spices through it. I think it looks beautiful to be able to see all the colors of the herbs and spices. I agree with you, Deric. Indeed, the colours of herbs and spices are a beauty. I, too, prefer a clean unobstructed counter top. Thus having a purposeful spice rack will enable you to display those beautiful herb and spice jars neatly on your kitchen counter. The Belwares Revolving Countertop Carousel Set will do the job. Alternatively, the Decobros Wall Mounted Rack is a good choice. Hi Sharon – yes, spice storage is a problem. I’m a cook not a chef 🙂 and over the past 10-15 years I’ve been experimenting with a range of dishes. Being a vegetarian, I find spices are very important and can totally transform an otherwise so-so dish into something that little bit special. As my spice collection grew, I kept the jars in two cupboards, basically fitting them in where there was a space. Necessity being the mother of a good shopping expedition 🙂 I looked at what was available. Selecting the right spice rack is not easy! I finally settled on one very similar to the DECOBROS 3 Tier rack although made of wood and it could also stand on the kitchen top which is where I wanted it. I wanted to be able to see ALL my spices at once so I knew immediately what was avaiable. Out of sight, out of mind. Many’s the time I’ve bought another jar of a spice only to find one hiding in the cupboard. The problem with this, and many spice racks, as you point out, is that some jars won’t fit so I still had a few jarjs on the kitchen top and in the cupboard. However, my arrangement was, at last, manageable. I moved house a few years ago and now have a much smaller kitchen. Alas, the spice rack had to go 🙁 However, I do have good drawer space and bought something similar to the YouCopia so I could keep the jars face up in a drawer. It works well but I’m a little resentful of the wasted vertical space above the jars although I usually throw some tea towls on top. Anyway, having read your wonderful guide I am now thinking I should free up my drawers and look for an alternative and unless/until I get a kitchen with more counter space it will have to be wall mounted. The DECOBROS 3 again comes to mind 🙂 I like being able to see everything I have at a glance. Thank you for your time, sharing your experience here. Seems like you missed your 3Tier Rack. I am sure it is very useful to have. You are correct – seeing all the spices at one glance is important. You do not want to burn the ingredients while looking for the spice needed, buried somewhere deep in the cupboard. Happy shopping and cooking. Oh, do let me know which spice rack you bought.